The doctors are available from 08:00 to 18:30 every weekday except Bank Holidays. When the surgery is closed during these hours, if you need a doctor urgently they can be contacted by ringing their mobile. The mobile phone number is 0780 716 9442. If you need medical assistance which cannot wait from 18:30 until 08:00 and at weekends and bank holidays, please dial 111. 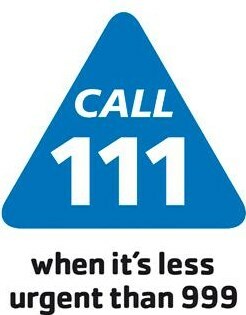 Calls to the NHS 111 service are free from both landlines and mobile phones. The NHS has launched a campaign to help people in South Gloucestershire to choose the right health service when they are feeling unwell or are injured – allowing busy services like A&E to treat people who need them most. Across the country, approximately 47 per cent of people attending an A&E department could have received the same service via their GP, by telephoning NHS 111 or by calling in at an NHS walk-in centre, minor injuries unit or urgent care centre. Local people are being asked to Think ABC before A&E. For more information, please visit www.thinkabc.org.uk or download the leaflet here.